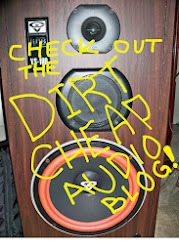 This blog needs a little spring cleaning. First, I'm going to start rehosting more of my reviews here so that I can finally kill off the dead links that continue to afflict these pages. If you've been reading for awhile, please bear with me while you see a mix of new and old. Next, I've got to figure out how to rebuild my list of blog links. The widget stopped working when I got the new domain name. Beyond that, we should have a mix of interesting watch reviews in the weeks ahead. As I write this a super cheap watch is coming my way on a slow boat from China. It should be interesting.